Get the Little Ones Involved with a Lawn Mower for Kids! 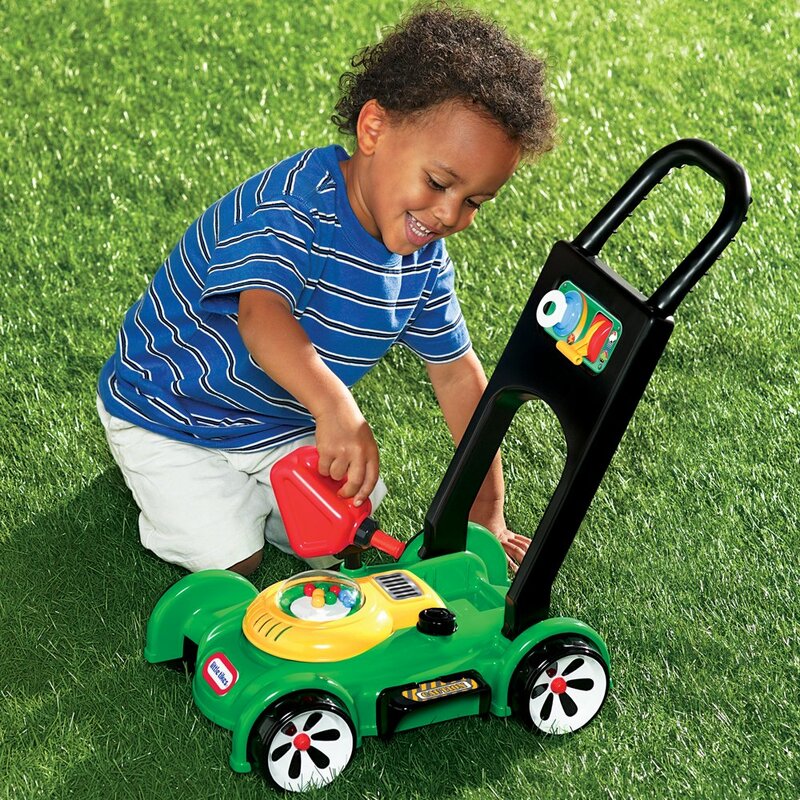 >> Get the Little Ones Involved with a Lawn Mower for Kids! When raising children, it is important to teach them from a young age how to be responsible and to tend for the household. This is exactly why you should promote any form of play pretend when it comes to daily chores. Since they will most certainly frown upon housework, you need to figure out a way to make it appealing to them. A good start is with these suggestions of a toy lawn mower for kids. Don’t task them with the burden of doing the dishes right from the start! Instead, take them outside to enjoy the open air. 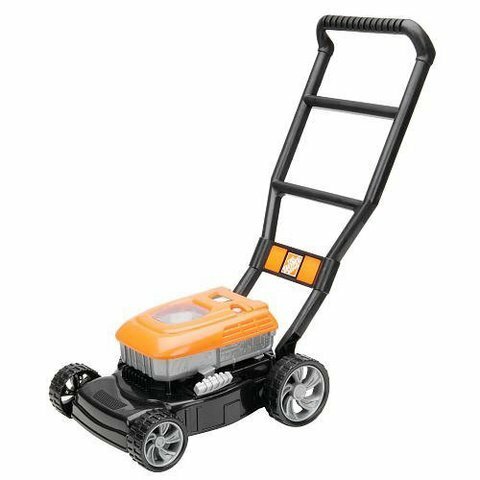 While you’re at it, equip your toddler with one of these lawn mowers for kids and teach them how to care for the garden. If you keep it playful and captivating enough, you will soon find yourself assaulted with countless lawn mowing requests every day. Since children are awfully clumsy, you most certainly don’t want them handling sharp tools or high voltage machinery. This is why, in order to prepare them for adult life, you need some realistic toys that resemble everyday objects. As a result, the little ones will start to understand from a young age how different tools work and what is their purpose in a household. Seeing that there is not much to teach them about a broom and dustpan, you may want to consider taking things up a notch. Invest in a toy lawn mower for kids and initiate them in the ways of a healthy garden. 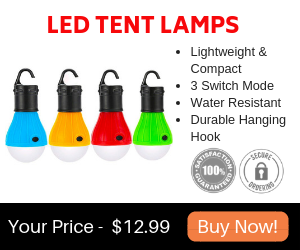 Show them how to use one and let them roam free in your backyard. If they have enough fun, do not be surprised when they come asking for more playtime in the yard. If you decide to buy your children a toy that lacks appealing features, you are not going to get very far. Children love to play with toys that put them to work and stimulate their imagination. This particular lawn mower for kids is perfect for that. It not only looks like a real life grass cutting machine but also sound like one. After all, the devil is in the detail. As a result, this highly educational means of fun features an engine sound that gives off the impression that the toy works just like a real lawn mower. However, to keep it appropriate for your kid’s age and in order not to scare them off, it also comes with colorful popping beads on the front. Furthermore, a fake gas can comes with the toy lawn mower for kids, in order to deliver a more genuine experience. The clicking key and mobile throttle just add a bonus of authenticity to the whole thing. Also, your children will be able to hear the engine sound only if you pull the cord. 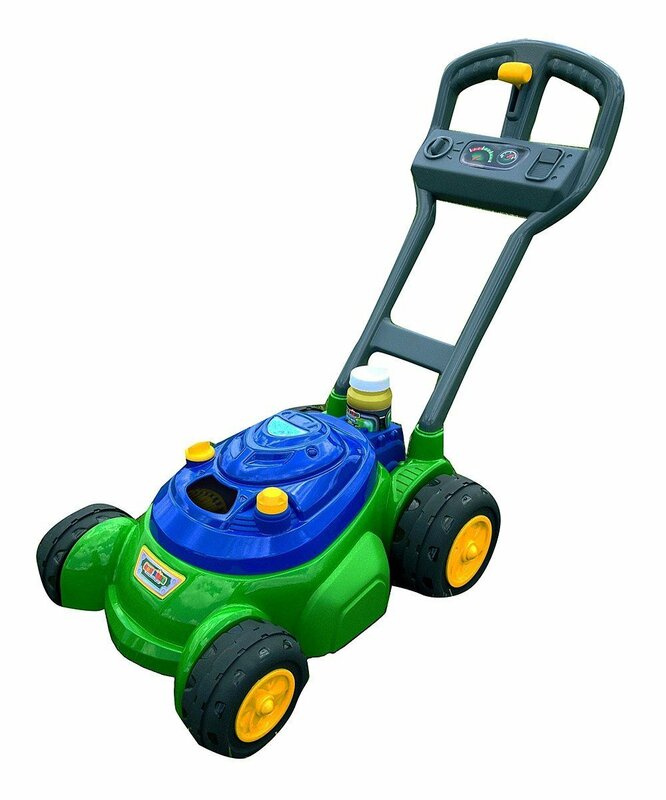 This particular type of lawn mower for kids does not require any batteries, as everything is mechanical. As a result, the little ones can benefit from the same experience anytime they decide to play with it. 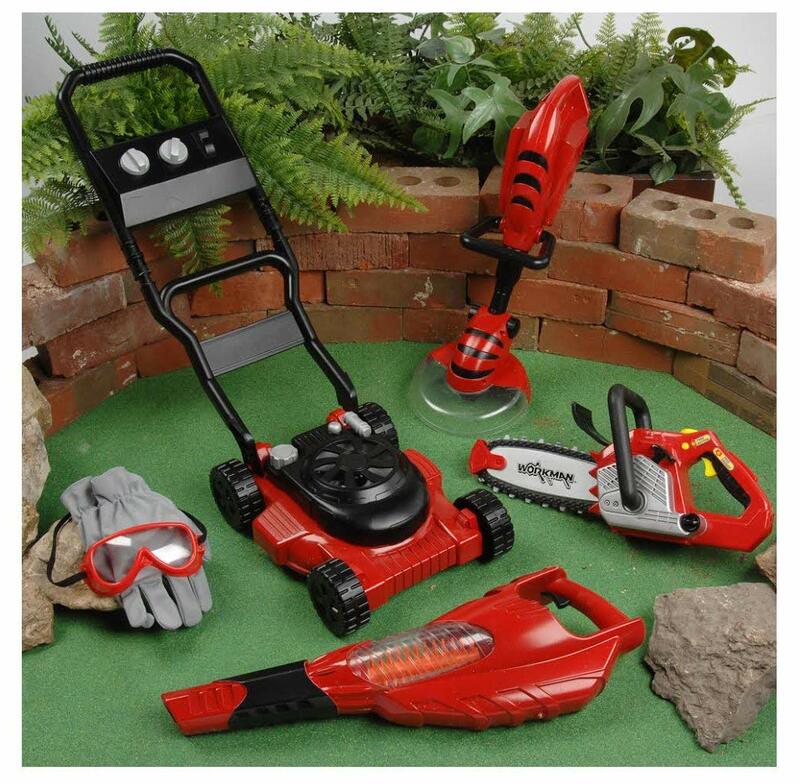 If you’re looking for more than just a lawn mower for kids, this is just the thing for you. This pack of gardening toys that resemble real-life tools consists of a various range of items that deliver the full gardening experience. As a result, you will find here a toy leaf blower, chainsaw, weed trimmer, goggles, lawn mower, and work gloves. This set is perfect for any kid aged 4 or up. Hence, you will be able to talk about more in-depth details with your kid when it comes to properly care for the garden. This complete set of toy gardening tools is even more awesome because of the educational benefits it offers. This wide range of different items along with your knowledge of how everything works will teach your little one about everything he needs to know when taking care of the garden. As a result, he will be able to pick up on gardening tips from a young age which will help him quite a bit in the long run. 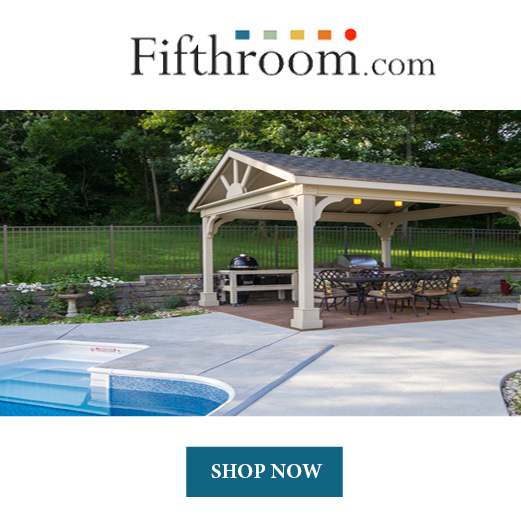 Because of the weather, your kid won’t be always able to play outside. This is why, even though they can’t enjoy the open air, you can still teach then about gardening from the comfort of your living room. This particular lawn mower for kids is exceptionally great at this. 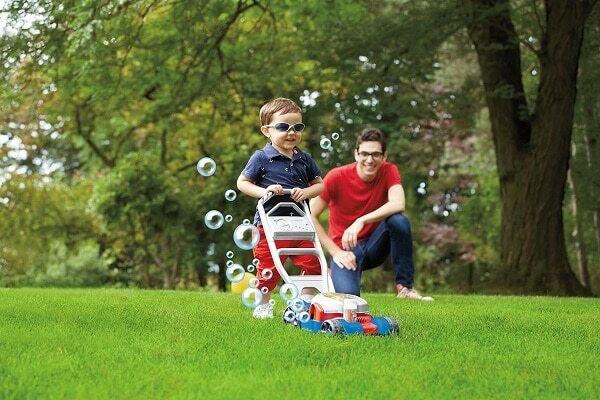 Thanks to the soft materials and smooth plastic wheels, your kid can run around the house with it without any problems. As a result, you don’t have to worry about any kind of damage around the house. Unless he doesn’t knock over a vase or something like that. Other than that, this educational toy offers only the best features that will make your children want to play with it all day long. For instance, it benefits from ingenious voice prompts that warn your kid to check the oil and gas levels. Just like he would operate a real-life lawn mower, like the grown-ups. Also, the handle folds down so you can easily and properly store it away after the little one ends his educational adventure. Furthermore, each of the four buttons available plays a different sound, in order to entertain the toddler. This lawn mower for kids needs three double A batteries to power the toy up and deliver the best educational experience for your little ones. Yet another great gardening set for your children is this elaborate pack. It contains pretend play toys such as a wheelbarrow, rack, shovel, watering pot and last, but not least, a lawn mower for kids. Each item is made of plastic and features beautiful bright colors. This will make your job of persuading them to help you out in the garden a lot easier. Not only will your kid learn how to mown the lawn, but he will also be able to help you plant seeds or gather the leaves. If you stick just to lawn mowing, your little one is more likely to lose focus and get bored easily. This is why it is important to provide him with a wide range of different both fun as well as educational activities. As a result, he will learn much faster everything you want to teach him if he finds great joy in helping you around the house. If you already own a toy lawn mower for kids, but the little one doesn’t take much interest in it, something must be wrong. There are some reasons for why a child would refuse to play with a certain toy. One of these reasons may be the design. Sometimes, going for the one to one replica doesn’t pay off. However, you don’t need to worry. Just buy your kid another toy. 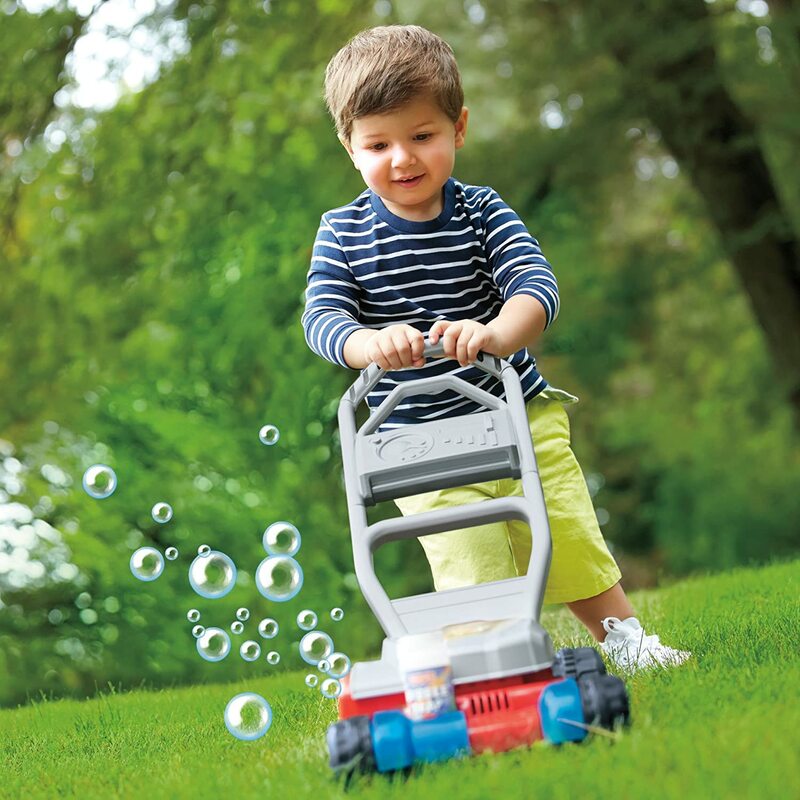 If you are really keen on teaching him about how to keep a fresh and healthy lawn, you should consider getting him a more playful toy lawn mower. 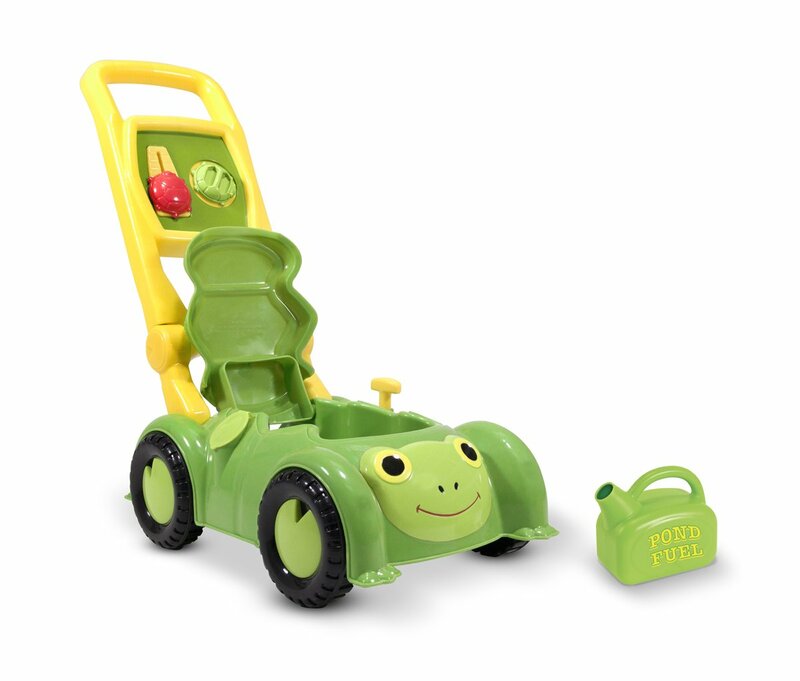 This Tootle Turtle lawn mower for kids features an appealing design of a cartoon character that will make it irresistible for the little ones. On top of that, it also comes with a storage compartment, a fake plastic fuel can, pull-cord and clicking dials. Also, the sturdy plastic makes it perfect for both indoor as well as outdoor gardening role-play. Usually, girls like to play with dolls and other toys more suited for them. However, it is not entirely unusual for some of them to like getting their hands dirty and take up on some activities that are more suited for boys. At the same time, it is no surprise that women like flowers or other colorful plants all the same. So, in order to prepare her to better understand how gardening works from a young age, consider offering your daughter a lawn mower for kids. 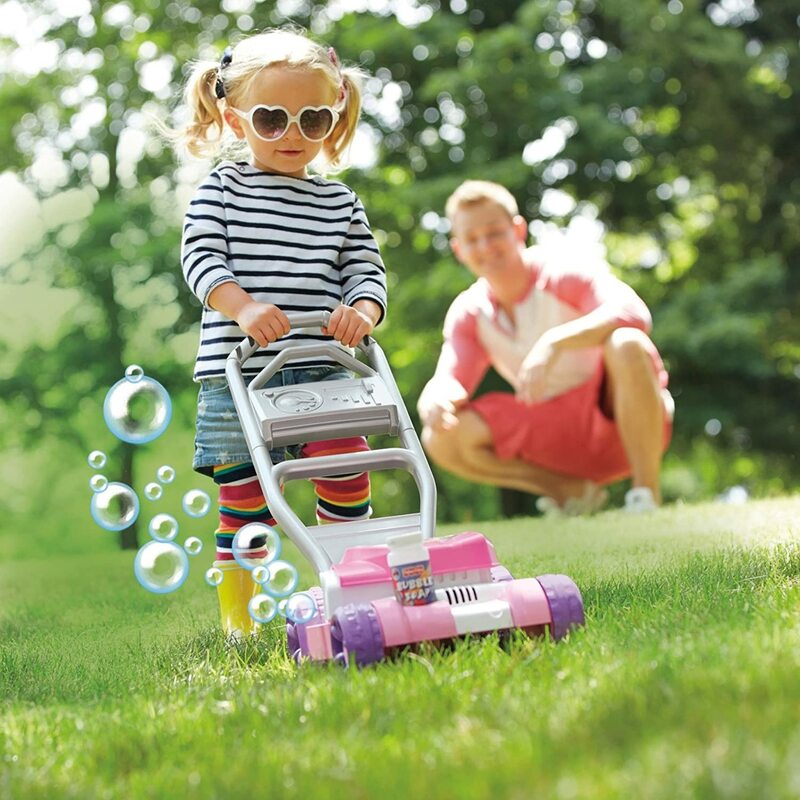 This pink replica of a life-size lawn mower will prove highly beneficial to her education. Learning about keeping a lawn fresh will come in easy if she enjoys every minute she spends acquiring new skills doing fun activities. On top of that, this particular lawn mower for kids pops out soap bubbles every time she pushes it around the yard. If you’re worried about the fact that she might not enjoy learning to manage household chores the way you expect, think about the last time you saw a kid crying when blowing soap bubbles. That is exactly right, never. As long as this feature keeps her entertained, you have nothing to worry about. 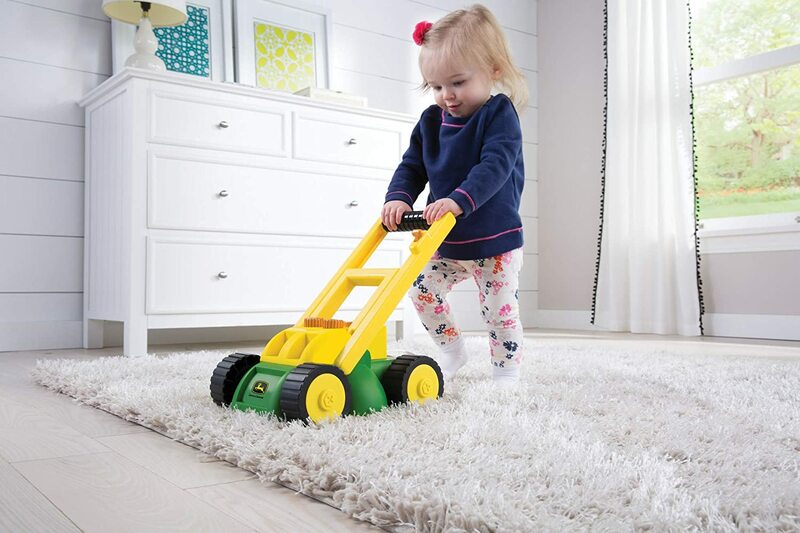 A nice addition to your little one’s toy collection is this lawn mower for kids. Like the previous example, this one also features soap bubbles. However, if you decide to purchase this particular toy, you need to know that an extra bottle of bubbles comes with it. This way, you will not run short on supplies when purchasing this educational toy. Also, you don’t need to worry about spending money on batteries. Even though this toy makes all sorts of gear noises, everything is mechanical. Furthermore, the bright colors are highly appealing to any 2-year old or above. With this many fun features packed into one toy, your kid will enjoy every second he spends learning about lawn mowing. Investing in a proper education from a young age for your children will benefit them in the long run without a shadow of a doubt. In order to do that in a creative and fun way, think about investing in educational toys that they can use in order to replicate a wide range of activities you do around the house. This way, he will actively learn everything he needs to know to become a successful adult later on, with ease. For example, consider buying a lawn mower for kids for your son’s or daughter’s next birthday. 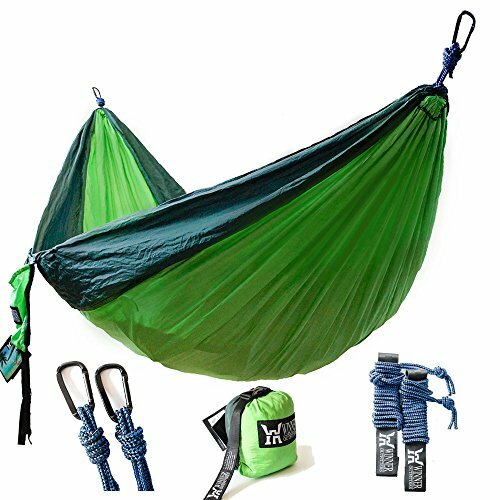 Even though it may not seem appealing to them at first, they will quickly fall in love with the wide range of features and benefits these toys provide. You can, later on, enjoy the fruits of your labor, when they grow up and do the lawn mowing for you.